E-Torah is the weekly online publication of the Chabad Jewish Center. Sign up for the E-Torah and receive a weekly e-mail with an inspirational and educational message. 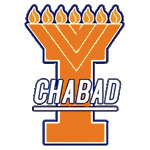 Plus, keep up with the happenings at the Chabad Jewish Center.